Is Climate Restoration an Appropriate Climate Policy Goal? 기후 복원은 과연 적절한 기후 정책 목표인가? Is climate restoration an appropriate goal for humanity's response to climate change? What combinations of assumptions regarding technology cost, performance, and other factors are consistent with a future in which climate restoration might be considered possible? Under what conditions would a climate restoration goal prove catalytic and avoid moral hazard, that is, increase the likelihood of reaching both restoration and other important climate goals? How can the risks of climate restoration be managed in those futures in which it does seem possible or catalytic? Since the 1992 United Nations Framework Convention on Climate Change, society has organized efforts to limit the magnitude of climate change around the concept of stabilization — that is, accepting some climate change but holding it within acceptable bounds. This report offers an initial exploration of the concept of climate restoration — that is, approaches that seek to return atmospheric concentrations of greenhouse gases to preindustrial levels within one to two generations. Using a simple integrated assessment model, the analysis examines climate restoration through the lens of risk management under conditions of deep uncertainty, exploring the technology, economic, and policy conditions under which it might be possible to achieve various climate restoration goals and the conditions under which society might be better off with (rather than without) a climate restoration goal. This report also explores near-term actions that might help manage the risks of climate restoration. Restoring atmospheric concentrations to preindustrial levels could prove possible at acceptable cost in two scenarios: (1) a best-case carbon capture scenario in which direct air capture technology achieves its most optimistic cost and performance assumptions and (2) a low-cost capture and abatement scenario in which reducing greenhouse gas emissions also proves relatively inexpensive. Setting a climate restoration goal could catalyze the deployment of negative emissions technologies that remove greenhouse gases from the atmosphere. But such a goal could also reduce the likelihood of successfully decarbonizing the global economy. Pursuing a climate restoration goal would avoid such a moral hazard under conditions in which successful negative emissions technology is at least half as likely as successful decarbonization. If climate restoration proves possible and catalytic, it would reduce the risks of extreme climate change and make meeting other climate goals more likely. In the longer term, the pursuit of climate restoration has some favorable policy persistence characteristics. If the technology proves viable, a growing climate restoration industry might promote policies favorable to its continuation and growth. An ambitious climate restoration goal might seek to achieve preindustrial concentrations, not by 2050 but toward the end of the 21st century — perhaps by 2075, according to some reckonings the 300th anniversary of the beginning of the Industrial Revolution. To avoid the risk of overshoot, a climate restoration goal might best be combined with a 2°C temperature target. Climate restoration would be a public good. Efforts to ensure the necessary funding for midcentury climate restoration activities would benefit from near-term attention to longer-term financing mechanisms. Adopting a risk management framework and regarding the approach to climate change as a process of policy experimentation could help society achieve the opportunities offered by a climate restoration goal and avoid the adverse effects. This project is a RAND Venture. Funding was provided by gifts from RAND supporters and income from operations. The research was conducted by the Infrastructure Resilience and Environmental Policy Program within RAND Justice, Infrastructure, and Environment. 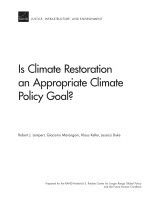 Lempert, Robert J., Giacomo Marangoni, Klaus Keller, and Jessica Duke, Is Climate Restoration an Appropriate Climate Policy Goal?. Santa Monica, CA: RAND Corporation, 2018. https://www.rand.org/pubs/research_reports/RR2442.html.